Zip along the grand boulevards and historic squares of Berlin on a thrilling 2-hour Segway tour. Learn to operate your easy-to-use self-balancing Segway, then follow your guide on a scenic tour of the German capital. Glide past Berlin landmarks like the Brandenburg Gate, the Reichstag and Museum Island, follow the scenic Spree riverfront or jump off to admire Berlin Cathedral or visit the emotional Jewish Memorial. 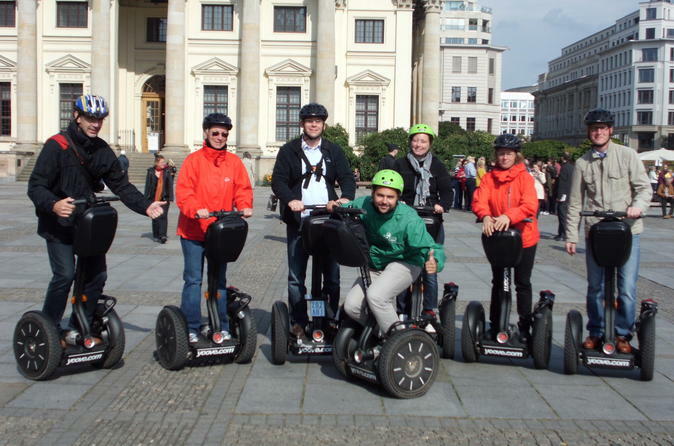 Meet your group and guide on Potsdamer Platz in central Berlin and enjoy practice time to get familiar with your Segway and learn the basics of stopping, steering and balancing before heading out. Once you’re comfortable operating your Segway, follow your guide on a whistle-stop tour of the city and whizz between the central sights. Itineraries vary depending on your group’s preferences but you might want to glide around the Brandenburg Gate, zip along the banks of the River Spree or cruise through Tiergarten Park. Along the way, learn more about the city’s fascinating history from your guide and jump off to snap photos of Berlin Cathedral, the Reichstag or the Memorial of the Murdered Jews of Europe.